Natalie Portman before and after nose job plastic surgery. Natalie Portman is a real stunner in the Hollywood beauty ranks, but is she all natural or did she need some help from the local plastic surgeon? 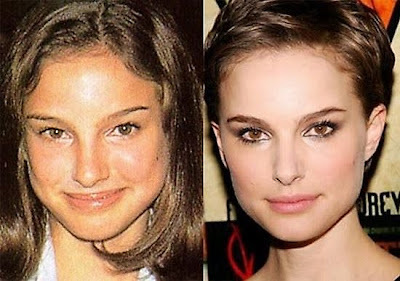 I wanna believe the delightful Natalie Portman of today, is free from any plastic surgery, but its really hard to argue with the before and after pictures of what looks to be a nose job. What do the readers think? Has Natalie Portman had a nose job? No doubt about it, thats a nose job! Definitely it's nose job. Just compare her too old and new pictures.The major difference between nose shape.she got a perfect output of nose job. no - no job done. It looks like her nose is bigger in the first pic but it's an optical illusion. the forst pic shows her without makeup, and high shine on her face. this always emphasises the nose. second pic she is wearing full makeup and the shadows of her nostrils have been filled with highlighter - it's a common trick in makeup artistry and really works! (i work in the industry and know this). shine on the nose makes it appear larger, and the shadows without matt makeup are more obvious. she's got a great makeup artist - not a surgeon!! Not sure. In the first pic, she is much younger and it may be that she has just grown into her nose. When I was a teen, I thought I had the largest nose in the world but now, as an adult, people would laugh at the idea. My nose appears much smaller, although I can assure you that I've had nothing done! I think she has had a nose job- even the bridge of her nose is smaller now. It looks like they made her nostrils smaller and left the tip of her nose as it was-which made the nose job pretty unnoticable until you see the two pics side by side. Who's her plastic surgeon???! It irritates me that stars don't reveal this. I want the same thing she had, leave the tip along and make the nostrils smaller. Sorry suckers - while your face shape does change as you age, the nose doesn't mysteriously shrink w/o a lil' help. YES it's a nose job. If you look at other photos besides these, it becomes even more obvious. But at least it's a good one. I think it's because in the first picture she is smiling and in the second picture she isn't. When I smile, my nose stretches out and looks bigger than when I just have a relaxed face. Anyone who has seen Black Swan knows she had one, or you are blind. No, it's all about how her makeup was applied. If you know anything about anatomy when she smiles the gap between her nose and her mouth is going to shorten. The bridge of her nose is not smaller... On top of all of that she was pretty young in the first picture, our faces change to some extent as we age. No she has not. In the first picture she is clearly without makeup, and also a much younger Natalie. Plus if you know anything about anatomy when you smile or smirk your nose usually widens and the space between your nose and your lip shortens.